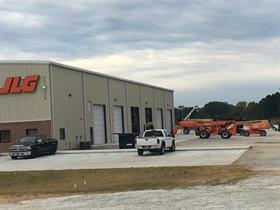 JLG Industries has opened a new service centre in Hiram, Georgia. The 14,400 sqft. (1,340 sqm) eight-bay Atlanta-area facility joins the growing list of JLG service centres that includes facilities in Houston, Texas; Riverside, California; Hagerstown, Maryland; and Rock Hill, South Carolina. The new centre will inspect, maintain and repair all brands of lift and access equipment at the facility or on location at a customer’s jobsite. Services include quarterly and annual ANSI-required mobile elevating work platform (MEWP) inspections, preventive and planned maintenance, light and heavy repairs and mobile service for customers who preference on-site service of their equipment. "We provide comprehensive service for JLG and non-JLG branded equipment to help maintain the overall health of our customers’ mixed equipment fleets," says Andy Tacelosky, JLG Industries chief operating officer. "Strategically located centres like our newest location in Atlanta enable us to respond quickly to the needs of our customers and their customers, increasing the amount of uptime of their machines, which boosts productivity and drives down total cost of ownership." In addition to its 12 service bays, the Atlanta area service centre includes a wash bay, four 10 T overhead cranes and fully equipped mobile service vehicles. Separately, JLG has launched a new full-service retail lending program from JLG Financial. The new retail financing program offers 100% financing, a quick and easy application and flexible payment plans, among other customer-focused features, and is available in the United States. The program supports new or used equipment of any make or model, including both reconditioned and certified equipment, and it allows borrowers to choose from a variety of flexible financing options. "This service offers end-users an extraordinary level of financial flexibility, giving them more options to design the solutions they need with affordable terms that meet their unique business requirements and objectives," says Matthew Coldsmith, JLG director of finance. "All of this helps ease the process for our rental customers when they are selling equipment." The new retail financing program is supported by LEAF Commercial Capital, Inc., a leading U.S. equipment financing company and subsidiary of People’s United Bank. "A strategic benefit to customers is the cutting-edge technology backing this service, allowing for fast and simple credit decisioning and the elimination of cumbersome paperwork associated with most lending processes," says Coldsmith. "Sales can close more efficiently, and customers can get their equipment onto the jobsite quicker." He claims customers applying for financing through JLG Financial can submit applications for approval and get credit decisions in under two hours. "We are pleased to be chosen as JLG’s partner to bring their rental house/distributors this streamlined, retail financing program," says Joe Banister, LEAF vice president of business development. "We look forward to delivering fast, flexible financing solutions that support the business goals of JLG, its rental houses, and their customers."